The E-Marketing Manager offers out-of-the-box many analyses for measuring the success of your campaigns and the development of your mailing list. With our Analytics Package you get complete new insights, which help to further increase your success. Afterwards we introduce the additional analyses and their benefit in detail. 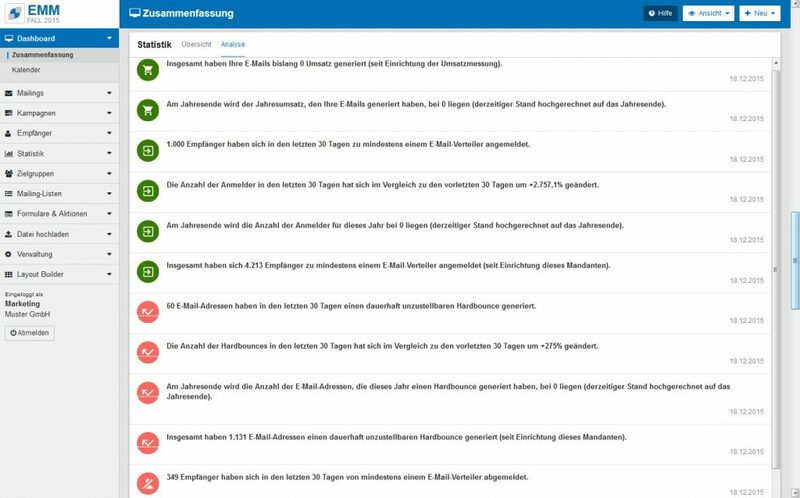 Exceptional Lead Management using continuously enriched data is very important for the automation of marketing. Checking the quality of the data is very important and has a high priority. 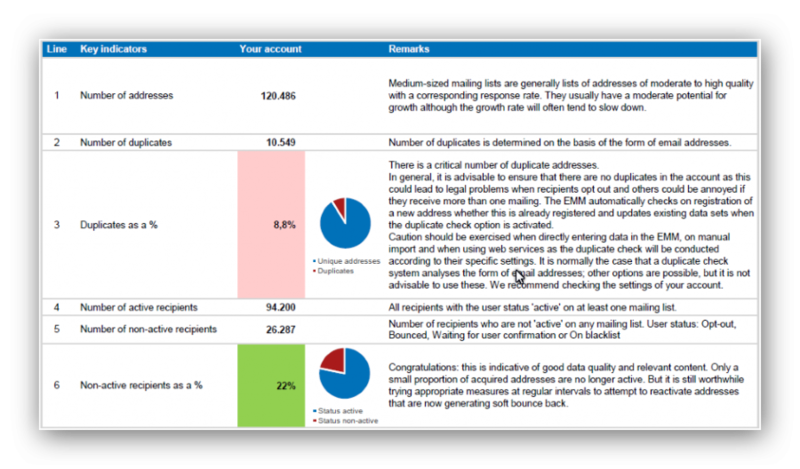 With the help of the Data Quality Report from AGNITAS, you can detect mistakes and simply correct your data. Using a variety of characteristics, the Data Quality Report will analyze where this potential for optimizing your recipient data is. At one glance from you, a color system will indicate if everything is good (green) and where there might be a need for additional work. The quality of the data has a direct effect on your results. Mistakes have an unprofessional impact. No one wants to use the incorrect form of address for recipients or address them with cryptic umlauts in their names. The data can also be improved, for example, by supplying the correct form of address based on analysis of the first name. The report can also discover more significant problems, such as when the number of bounces suddenly jumps or only a fraction of the active recipients is being addressed because the target group has been setup incorrectly. The Data Quality Report will provide you with information about such and other related issues. If you would like us to, we’d be more than happy to help you realzing the optimization proposals! 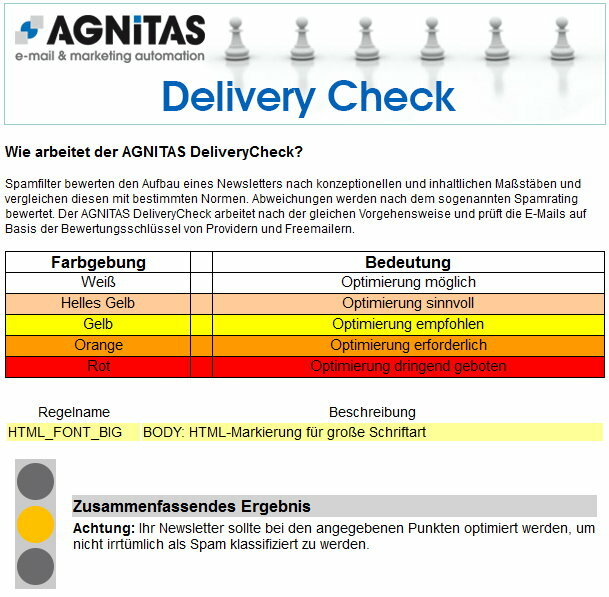 Both of AGNITAS’ delivery checks will help you to improve your ability to reach recipients’ mail boxes with your mail offers over the long term. Because the checks are conducted both before and after transmission, they will provide you with a comprehensive image. integrated Bayesian filters that statistically calculate the probability that a new message might be categorized as desired or undesired based on previously received emails. 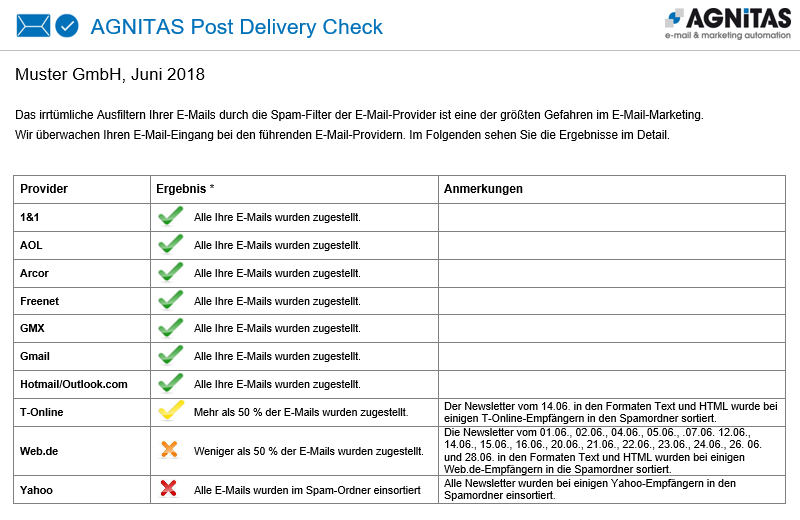 The Post-delivery Check is a detailed monthly report that indicates the actual receipt by the leading free mail and Internet service providers. Based on the test addresses, the analysis will check if the message will be placed in the Inbox or the Spam folder. You can determine which providers will be included in the analysis report. By using it, you can learn which providers might require additional collaboration and benefit from such in a simple manner. The premium version of the Marketing Intelligence Analyzer (MIA) will give you additional statistics and forecast values for the development of distribution lists and mailing performance. With it, you can watch for trends and make projections about distribution list growth, revenue and similar values to the end of the year, for example. This is not just a nice feature for budgeting the results with a view towards the end of the year. You will also be able to detect negative fluctuations and where they can be improved by countermeasures. In addition, the premium version will provide the statistics on a daily basis, not just every 14 days. Interested in the Analytics Package? We would be glad to inform you about it!